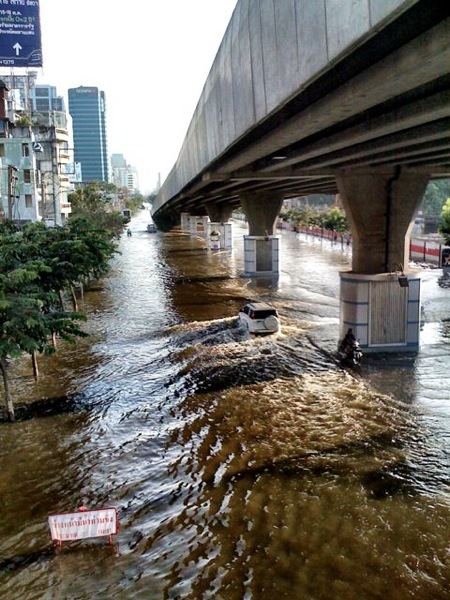 Floodwaters continue to swamp Lad Prao and surrounding areas, in Bangkok’s north. Chatuchak district is now also affected. Some MRT (subway) stations are still being monitored, but both that network and the BTS Sky Train system are still running. The death toll has risen above 500. Central Bangkok is still largely dry. Again, a reminder: Thailand’s international airport, Suvarnabhumi, is still functioning normally, though the domestic airport, Don Muang, remains closed. Here are some cell phone images I snapped late this afternoon just outside the Lad Prao MRT station, near the Ratchada-Lad Prao intersection. To the right of this image (below) is a Lad Prao MRT station entrance, which remains dry despite the surrounding water. 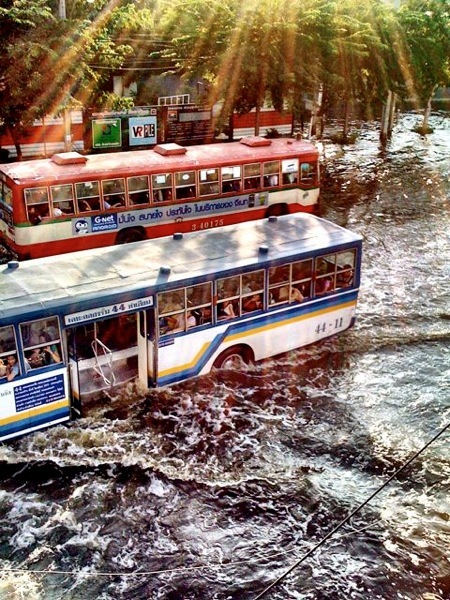 City busses were still running. The death toll from Thailand’s worst floods in half a century climbed above 500, as advancing pools of polluted black water threatened Bangkok’s subway system Monday and new evacuations were ordered in the sprawling capital. The latest district added to the government’s evacuation list late Sunday was Chatuchak, home to a large public park and an outdoor shopping zone that is a major tourist attraction. The Chatuchak Weekend Market was open but missing many vendors and customers Sunday as floodwaters poured past the market’s eastern edge. So far, Bangkok Gov. 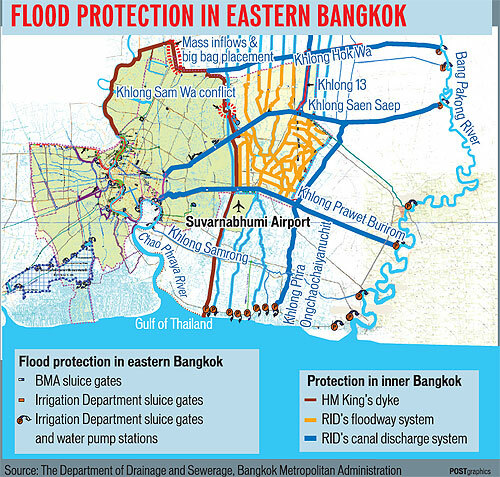 Sukhumbhand Paribatra has ordered evacuations in 11 of Bangkok’s 50 districts, and partial evacuations apply in seven more. The evacuations are not mandatory, and most people are staying to protect homes and businesses. But the orders illustrate how far flooding has progressed into the city and how powerless the government has been to stop it. Thai officials moved to defend two Bangkok industrial parks near the main international airport from a deluge that has swamped hundreds of factories over the past month and is now coursing through the capital. More than 100 pumps are pushing out water leaking into Bang Chan industrial zone in eastern Bangkok, according to Vice Industry Minister Suparp Kleekhajai. Nearby Lad Krabang industrial estate includes a factory operated by Honda Motor Co., which abandoned its full-year profit forecast last week after another plant was flooded. In the neck-deep floodwaters of an industrial zone here, workers are using Jet Skis and wooden skiffs to transport stacks of computer components out of waterlogged factories. Three weeks after monsoon run-off swamped more than 1,000 factories across central Thailand, the brown, corrosive floodwaters have only slightly receded, leaving the world’s largest computer makers without a reliable forecast about when crucial parts will be available once again. When Thais see Sorayut Suthasanajinda’s Channel 3 news team in their neighborhood, they know their country’s spreading floods, which have now claimed over 500 lives, can’t be far behind. For weeks Mr. Sorayut has waded through brackish water, microphone in hand, bringing the full scale of the slow-motion disaster home to television viewers even as government leaders continue to reassure people that the worst is over. He has also turned his television news show into something of a first-responder rescue service that has helped fill the gaps in the Thai government’s own patchy aid efforts, quickly raising over $12 million in donations and creating a logistics machine that flings relief packages stuffed with noodles, burgers, bottled water and toilet paper to stranded victims perched on roofs or leaning out of second-story windows. 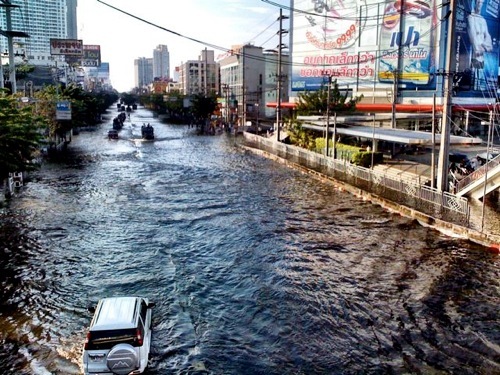 Now that the floods are moving to the edge of Bangkok’s business district after decimating much of the country’s manufacturing base, some people who thought they would be safe from floods are seeing Mr. Sorayut popping up in their backyards, too. What has caused the flooding? And finally, thanks to my friend H for asking whether the amount the rain this year has been remarkably higher than in years past. For more on this subject, I suggest the New Mandala blog, which has has some charts showing that rainfall throughout Thailand this year was, indeed, much heavier than in years past. In addition, the Bangkok Pundit blog has several posts about the level of water in Thailand’s dams this year, which could be an issue. You can find past posts by clicking the Thailand flooding tag. You can follow me on Twitter for more: @Newley. 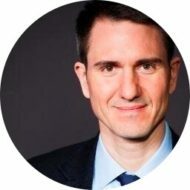 You can connect with my Facebook page. And you can sign up for RSS updates, or join my email list. I may not post every day going forward, but will aim to share major developments and useful resources as time allows.